When pawing through the mountains of monster toys from the '60s you are bound to stumble on the De Horribles. These rubber, jiggling monsters are similar to the AHI and Ben Cooper 6-inch jigglers, except that they are smaller and did not use any of the classic monsters. Each creature in the series is about 4-1/2 inches tall and comes with a jiggle string and a suction cup so that you can attach them to windows or review mirrors. The monsters incorporated a kind of human sea creature theme, ala Creature from the Black Lagoon. Most of the figures have tentacles or other fishy features, but also have arms and legs. 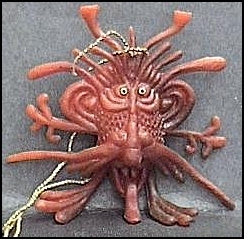 The De Horribles were sold in bags with header cards. The early cards are yellow and are marked Goldfarb Novelty Co. Later versions are red and are marked Barton Toys. They were also sold boxed as Funny Creatures.